Move over, road bikes -- hybrid bikes are increasingly taking a starring role in big city commutes. Some key differences in the design and components of the hybrid bike make it more comfortable for casual riders. The tires on a hybrid bike are almost always different than the tires on a road bike, and are much better equipped for rough roads, bike trails and avoiding flats. These tires are wider, have better grip and do more to deaden vibration to make your ride much more comfortable. Most road and hybrid bikes utilize a 700c wheel size, which is ideal for absorbing smaller bumps on pavement. The tire size of a 700c wheel is measured from where the bead or inner edge of the tire meets the rim. The bead set diameter of a 700c wheel is 622mm. Road bikes usually have thinner tires than hybrid bikes, which is measured by the width of the tire. A hybrid bike's rims will be able to accommodate wider tires than a road bike, and the frame and fork will also have the space for the larger wheels and a set of fenders. Hybrid bike tires are designed with a specific tread for performing on pavement and off-road conditions. These tires usually feature a central strip of smooth rubber for providing good grip on wet roads, with larger lugs toward the edges of the tire for digging into loose soil or sand. The lugs on a hybrid tire act as teeth for looser material, giving you enhanced control when compared to a road bike. The tire doesn't necessarily need to shed water, since a bicycle will never go fast enough to hydroplane; even a perfectly smooth tire will provide great grip in wet conditions when properly inflated. Hybrid bike tires are much wider than traditional road bike tires, which changes the performance of the bicycle considerably. A wider tire has a larger contact patch with the pavement, which provides much more grip. A wider tire also requires less air pressure, and reduces your chance of getting a pinch flat by distributing pressure over a larger area. Wider tires need a wider frame and fork to accommodate them, as well as a wider brake that can fit over the tire to reach the rim, so you usually can't throw hybrid bicycle tires onto your road bike. Hybrid bicycle tires absorb road vibrations much more effectively, making your ride more comfortable. There are some drawbacks to hybrid tires, however. 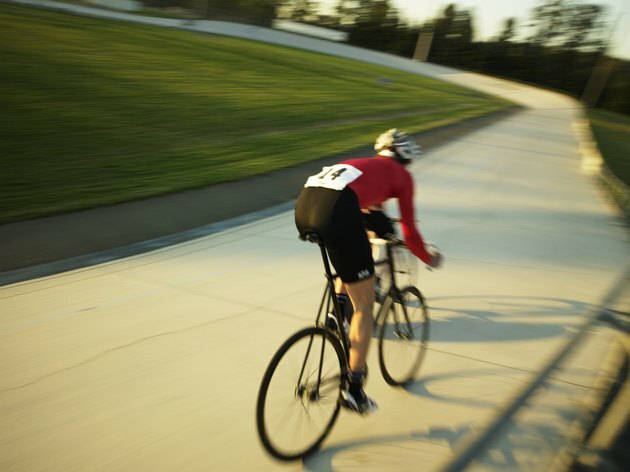 The larger tire also weighs much more than a road bike tire, which can make the bike feel harder to accelerate. The increased contact patch results in more resistance as well. Still, hybrid bikes are not designed for speed, and the benefits in comfort and control can make them an ideal choice for a commuter or casual rider who isn't looking to win any races.